Research shows conclusively that BREAST IS BEST! Not only is it the complete nutritious food for your baby, it also protects him/her from disease by building up baby’s immune system. It really is MUM’S MAGIC! Research shows that breastfeeding increases baby’s intelligence and reduces the risks of chronic health problems later in life. And it’s best for mum too! Nature prepares mum’s body to produce milk for her baby. Mothers from every culture and from all over the world have breastfed their babies since the start of time. As soon as baby is born he should be placed skin to skin on mum’s body and breastfeeding should start straight away. This gets mum’s milk flowing and sooths and comforts her baby. AND it’s a highly emotional time of bonding and connecting with the precious miracle of new life you’ve brought into the world. This special relationship mum has with her baby is really good for her mental and emotional health as well as baby’s. On top of that, breastfeeding has physical benefits for mum. It reduces bleeding and helps the womb return to normal; it helps mum to return to her normal weight; and if mum breastfeeds exclusively for 6 months and then continues to breastfeed until her child is 1 or 2, it reduces the risk of another pregnancy. AND, guess what – breastfeeding can lower a woman’s chances of developing diabetes, breast cancer and cancers of the womb and ovaries. On the financial side – because breastfeeding is free – it reduces financial stress! Commercial milk formula can cost over R100 every 10 days and there’s no free formula from clinics and state health facilities. Worldwide research shows EXCLUSIVE BREASTFEEDING is best for babies for the first 6 months of life. Exclusive breastfeeding means ONLY BREASTMILK for 6 months – no water; no glucose water; no tea; no porridge or fruit or vegetables; no medication unless prescribed by a health professional; no traditional, herbal or home remedies; no gripe water – NOTHING except breastmilk! Baby’s digestive systems are immature and anything other than breastmilk could damage the lining of baby’s stomach. HIV positive mums should exclusively breastfeed as well, but they must ensure they are taking their ARVs exactly as prescribed by health workers. And ALL mums should be using condoms to protect themselves from HIV and know their HIV status by testing regularly. If you are worried or experiencing any challenges with breastfeeding, do ask your clinic or health staff for advice and support and do sign up for MomConnect, the Department of Health’s free messaging service. So dads, families and communities – support ALL mums to exclusively breastfeed for the first 6 months of baby’s life! 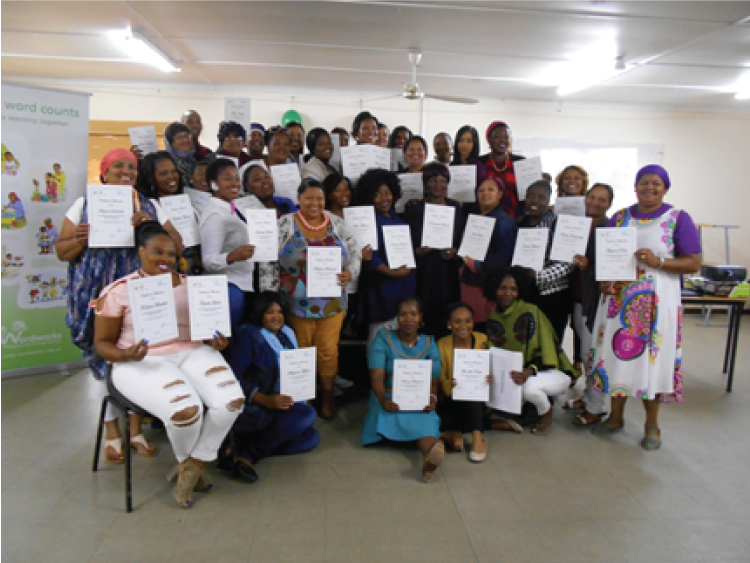 In November more than 35 Early Childhood Development [ECD] teachers and home visitors graduated from the ‘Every Word Counts’ early literacy and numeracy course. This practical ‘hands-on’ course gave ECD teachers plenty of active learning play activities to do with the more than 1000 young children in their care. The ability to read, write and do maths successfully in school, depends on the establishment of a strong language foundation in the early years. Parents and teachers play a critical role in establishing this foundation through using rich language in play activities, rhymes, songs and telling stories.